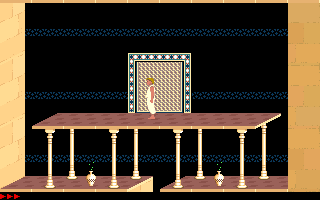 Description: Thanks to his flying carpet, Jaffar survived his first encounter with the prince. 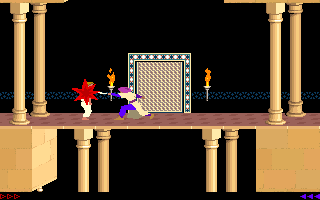 Jaffar has turned back time by destroying the magic hourglass, and has thrown the prince in another deadly dungeon. Yes, they aren't easy. YouTube has walkthrough videos though, these unravel most of the mysteries. Repetition of Time is one of the most elaborated mod of PoP1; for do it on must learn at memory the precious videos provided by you-tube: without them nobody would be able to obtain Life Potions and to finish many levels! Each one is very hard to do, and some include such unusual particulars. In Level 4 there are three different ways to go, and you can choose in which order; in Levels 10 and 11 there are respectively three and four ways to go, and you can choose the one to avoid. After all these years I still play at Repetion of Time! Time! Time! Time! Time! Time! Time! Time! Time! I tried to play it on SDL mode. Idk if there are some problems in SDLPoP, but I can't get through the door to next level. I have to open the door, then close it using the drop button in top left corner room of the level. However the game doesn't allow me to go through closed door. 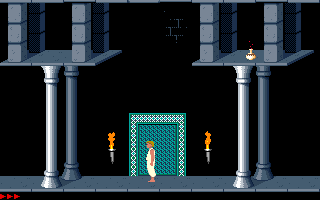 I tried to play it on DOS mode, used Shift + L to get to the level 7 and it works - I can get to next level.